UK’s Royal Navy launched a challenge, where young engineers and scientists had to imagine the future of underwater warfare and defense. Named Nautilus 100, a tribute to the USS Nautilus, the world’s first nuclear-powered submarine, the project was a cooperation with the not-for-a-profit technology forum UK Nest. Altogether 20 competitors came up with their ideas and designs, including members of companies like BAE system, Lockheed Martin, and Rolls Royce. The winning design has the form of a futuristic submarine, shaped like a giant manta ray. The hull will combine light and strong acrylic materials to get a super strong alloy, withstanding the pressure of depths of 1000m and more. The innovation about this: the hull will be 3D-printed completely. Inside the vessel, there’s room for 20 people, controlling the system with a high-tech brain interface. The propulsion system will have a silent cruising mode with up to 30 knots and a “fight or flight” system for high speed travel up to 150 knots. While the silent system would be powered by sucking water through the bow of the ship and expel it from the back, the speed system will be based on a powerful Casimir1 force battery. Also, the defense and help systems of the submarine are based on 3D printing technology. Part of the submissions was an eel-like unmanned underwater vehicle, which could act completely autonomic. The main operation field would be undersea communication and reconnaissance. Using sensor pods with blue-green laser energy, they will be able to set and secure a control network hundreds of miles apart. 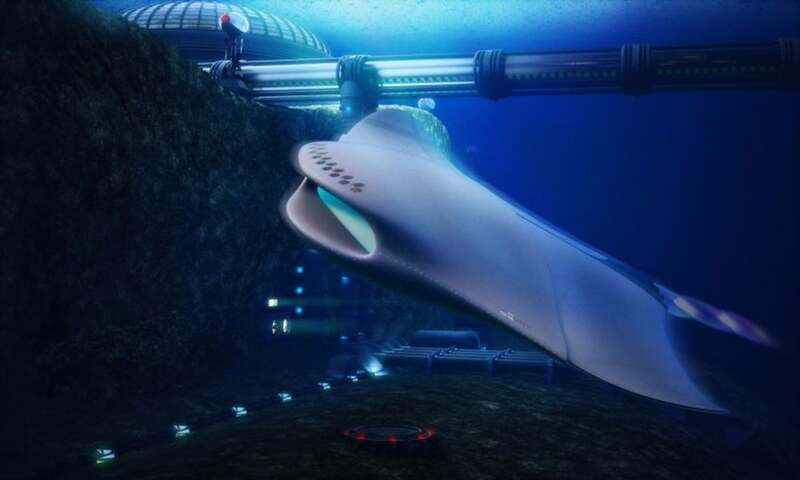 The eels will be equipped with pods, which can produce sensor and drone swarms via 3D printing. Gathering biological material from the ocean, they could constantly produce new drones and sensors. Furthermore, the submarine itself would get 3D printer solutions to produce self-defence decoys onboard. Future Outlook or Pipe Dream? Members of the Royal Navy are very optimistic and even compared these ideas with important historical revolutions in sea warfare like Nelson’s tactics at Trafalgar and Fisher’s Dreadnoughts. It’s also about the global race for new technologies and as Director of Submarine Capability, Rear Admiral Tim Hodgson says: “[…] for the UK being a leader in this race it needs to maintain its leadership in skills and technology.” But there’re other voices as well. Jonathan Peake, BBC defence correspondent, said in an analysis, that there are no resources and no budget to get these plans working. Nevertheless, these concepts show what might be possible with 3D printing and that some of the biggest companies in the world already work on such things.